Fish gelatin is commonly used in blocking solutions to minimize background noise in immunodetection procedures such as Western blotting and immunostaining. 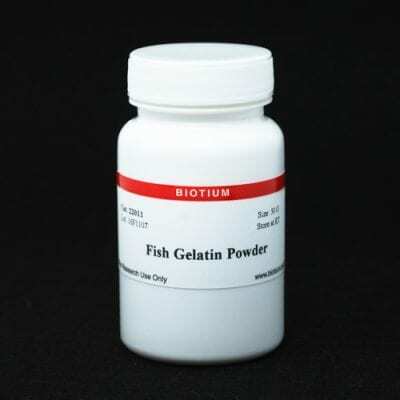 Because this gelatin is derived from the skin of cold water fish it does not cross-react with mammalian antibodies. Fish gelatin is commonly used in blocking solutions to minimize background noise in immunodetection procedures such as Western blotting and immunostaining. Because this gelatin is derived from the skin of cold water fish it does not cross-react with mammalian antibodies. Fish gelatin can be used in blocking buffers to block non-specific binding sites on positively charged nylon or PVDF membranes or for blocking and dilution of antibodies during immunostaining procedures. Bovine serum albumin (BSA) is commonly used as a stabilizing agent for proteins and enzymes, including dilute solutions of antibody and use as a blocking agent to reduce non-specific binding. This BSA is protease- and IgG-free. Bovine serum albumin (BSA) is commonly used as a stabilizing agent for proteins such as antibodies and enzymes, and as a blocking agent to reduce non-specific protein binding in immunoassays such as ELISA, immunofluorescence staining, and Western blotting. This is a 30% solution of BSA in water, prepared using IgG- and protease-free BSA. DAB (3,3'-diaminobenzidine) reacts with HRP in the presence of peroxide to yield an insoluble brown-colored product at locations where peroxidase-conjugated antibodies are bound to samples.